Travel is, without a doubt, a magical and rewarding experience, but what makes it truly remarkable is the beauty of a destination and the indescribable natural wonders that you find there. Puerto Vallarta is full of tradition, magic and attractions, along with an endless array of ecological activities that you can enjoy. One of the most impressive and memorable takes place in Banderas Bay, where you can immerse yourself in nature and interact with the most intelligent marine mammal, the dolphin, in its natural habitat. Dolphins are pleasant and cheerful creatures. We can often observe them jumping, playing and even hear their high pitched calls and whistles as they splash around in the ocean. They are some of the most intelligent mammals on earth. The predominant species in the Banderas Bay is the "Bottlenose Dolphin" These animals live in temperate and tropical waters worldwide. 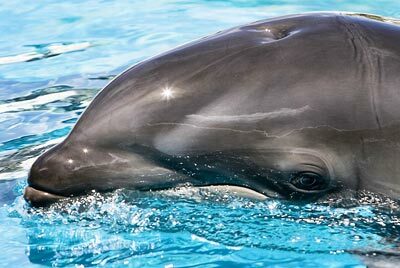 A type of coastal dolphin, they have adapted to living in shallow waters, though they’ll sometime migrate to other areas as a result of water temperature, food shortages or changes in eating habits. Along the Pacific coast of Mexico, dolphins birth their young in October. The mother is assisted by one of the “dolphin uncles”. After giving birth, she helps her newborn reach the water’s surface to take its first breaths and nurses him for approximately 18 months. Dolphins have highly developed senses, except for smell. Dolphins and humans have a history of positive interaction. Dolphins are known to have helped struggling divers and swimmers, and swimming with dolphins has been used as a type of therapy with great results. At Banderas Bay, the opportunity to interact with these amazing creatures in their natural habitat is a unique experience that helps to promote awareness and respect for wildlife preservation among people of all ages. Boat tours are available that take you deep into the bay, in the direction of the islands, where you can spot groups of dolphins jumping near the boats, as well as other mammals. On these spectacular tours, you’ll also see other marine life, including stingrays and majestic sea turtles, helping to make the experience one of the most fascinating and unforgettable of your entire life.